And Wetherspoons don't have music - and have other rules that us customers must adhere to, if we want to frequent them! 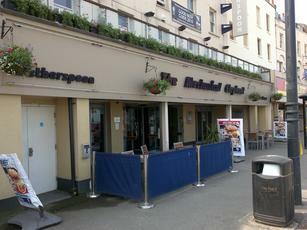 Fairly typical Wetherspoons, with the upstairs bar better for families/food/seaview. Pleasant pub, where many spend the entire day drinking and dreaming - and usually sitting in the same seats, beside numbered tables. A social club for some unsociable types. A sub-£20 budget will generate 10 pints of beer in a day; like all Wetherspoons, there is no music/juke boxes and the atmosphere is relatively quiet. Particularly, at the 8am opening. By now, I know some of the illustrious resident faces - a lot of which were watching the 6 Nations rugby there at the weekend. Although, sport is not usually a feature; beer is adequate to good. An unremarkable Spoon. Rather plain, and with a dead atmosphere.